The Device Control module is the first layer of security provided by Endpoint Protector. By defining granular access rights for USB and peripheral ports, device security is enforced while productivity is maintained. As a cross-platform solution, it protects the entire network, regardless if the computers are running on Windows, Mac OS X or Linux. The Device Control module allows management of the most commonly used device types and simplifies IT Administrators' lives in several ways. Providing all employees with the same device access rights may not work in every situation. Depending on the department and day to day tasks, different permissions could be required. The Marketing Department may need to use Digital Cameras while the Accounts Payable should not. Not just a result of the simple web-based interface and the granularity of Endpoint Protector, productivity can also be increased through the use of whitelisted devices. The company issued devices can be allowed throughout the entire company. Taking advantage of everything Device Control has to offer, enhance security one step further by implementing Enforced Encryption. With USB and peripheral ports already under control, ensure that all USB mass storage devices used throughout the organization are encrypted. The Content Aware Protection module is the second layer of security provided by Endpoint Protector. It prevents data leakage through all possible exit points, from clipboard, screen captures, USB devices, to applications including Microsoft Outlook, Skype or Dropbox. Through efficient content inspection, transfers of important company documents will be logged, reported and managed. The Content Aware Protection module allows management of file transfers via the most common exit points, preventing data leakage. Derived from the need to allow employees to use collaboration tools and online applications that make them more efficient, a Content Aware Protection Policy can eliminate the risks of data loss, leaks or data theft. With just a few clicks, a policy can be created, allowing for an in-depth content inspection of all file transfers. It works for Windows, Mac OS X, and Linux, so after selecting the operating system, enable the needed restrictions and apply them to groups, computers, and users or globally throughout the network. To get you started as quickly as possible, predefined filters and dictionaries are available for confidential contents such as Personally Identifiable Information or Credit Card Numbers. Moreover, pre-configured policies such as PCI and HIPAA are available. With an extremely short learning curve, the Content Aware Protection module provides various filters that go beyond Keyword Dictionaries and Regular Expressions. Multiple Thresholds, Blacklists, and Whitelists eliminate redundant scanning of file transfers, avoiding unnecessary use of resources or excessive logs and reports. To help customization even further, policies can be set to Report Only, offering the IT administrator a clear understanding of the file transfers taking place in the organization before implementing restrictions. Designed with both Small and Medium Businesses and enterprises in mind, robust and reliable, the Content-Aware DLP features provided by Endpoint Protector are a great fit for any network size. While its Active Directory integration and synchronization feature may not be used by most small businesses, it is definitely a requirement for larger networks. There are also many other additional features that make things more convenient and suitable for enterprise use, such as SIEM integration, terminal server or thin clients support and more. 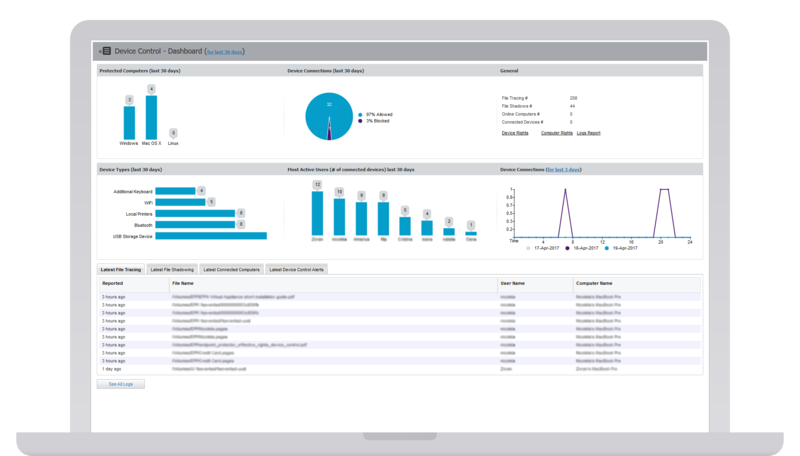 The eDiscovery module from Endpoint Protector provides Data Loss Prevention for data at rest. It prevents data breaches by scanning and identifying sensitive data at the endpoint level on Windows, macOS, and Linux computers. Endpoint Protector eDiscovery ensures compliance with regulations like HIPAA, PCI DSS and others. eDiscovery offers visibility into scans, identifying where confidential data resides and remediating by encrypting or deleting the identified confidential data. eDiscovery scans sensitive data residing on employees’ computers and provides the option to encrypt or delete discovered data. Graphic Files (jpeg, png, gif, bmp, tiff, psd, etc. ), Office Files (word, excel, pdf, powerpoint, outlook, publisher, etc. ), Archive Files (zip, rar, ace, tar, xar, xz, etc. ), Programming Files (c, cpp, java, py, pas, asm, dmp, xml, dtd, etc. ), other files (autocad files, text files, dta, xia, journal files, drm files, etc. ), Media Files (mov, mp3, mp4, wav, avi, vma, etc.). Credit Cards (Visa, Mastercard, Discover, JCB, Diners, Amex), Personally Identifiable Information (IBAN, date, e-mail), Address, SSN, ID, Passport, Phone Number, Tax ID, Driving License, Health Insurance Number, Internet Protocol Addresses. Inspect endpoints according to words and expressions relevant for your business added in dictionaries either through Type or Copy/Paste or through Import. Scan for specific files through the File Name Blacklist. All discovered files are reported and can be deleted or encrypted to prevent disclosure of sensitive content. Include Regular Expressions in your policy blacklists if you want to find the matching items of a certain pattern for confidential data. Make sure your organization is HIPAA compliant identifying sensitive HIPAA regulated data like addresses, phone and fax numbers, emails, FDA recognized pharmaceutical prescription drugs, firms, ICD-10 codes and diagnosis lexicon, and others. Apply the necessary remediation actions once data is discovered. With eDiscovery you can identify, manage, and control what confidential data is stored on your endpoints. Intellectual property (IP) like trade secrets, trademarks, copyrights, patents, industrial designs should be accessed only by authorized, trusted employees and in no circumstance leave the company. Endpoint Protector eDiscovery scans all documents residing on desktops, laptops, and servers, identifying and localizing IP as well as other confidential data, further offering remediation actions for proactive data breach protection. eDiscovery does not require separate installation, being easily activated within the management console with valid licenses. There is no need to setup a different server for management, making Administrators’ job easier. To be able to control, analyze confidential data, and comply with regulations like PCI DSS, HIPAA, FISMA, and others, an audit is required. With eDiscovery, auditing and remediation are possible, ensuring full monitoring of sensitive data via flexible scanning policies based on blacklists and whitelists. 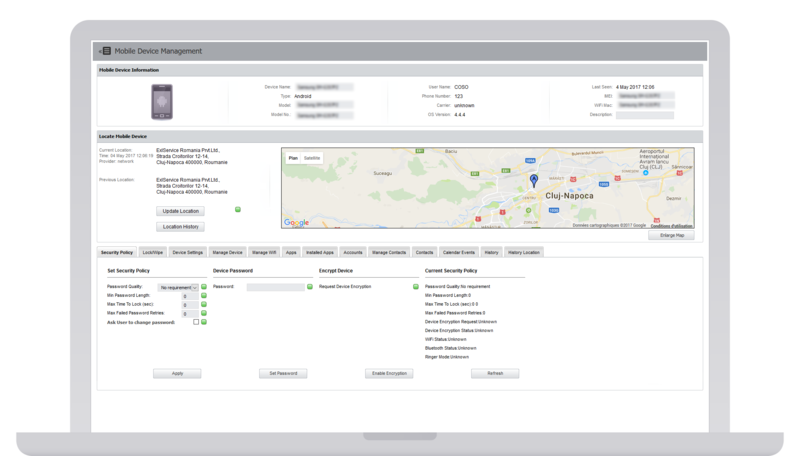 The Mobile Device Management module extends data security and control over the iOS and Android mobile device fleet. It also provides features for Mac OS X computers. Through remote enforcement of strong security policies, detailed monitoring, logging, and reporting of all mobile device activity, it provides enhanced protection against both insider and outsider threats. Moreover, it also includes Mobile Application Management. The Mobile Device Management is the third module of Endpoint Protector, offering data protection for the mobile endpoints. MDM by Endpoint Protector is available as Hardware and Virtual Appliance and it is the right solution that eliminates the need to spend hours just reading the installation guide. You have got it all already installed. We offer enhanced control over the use of latest Android, iOS, and Mac OS X versions available on the market, keeping up with employees' changing needs. Enroll your mobile endpoints in the Endpoint Protector server with a few simple steps to proactively control their use and set effective security and management policies. Bulk enrollment is available for big installations. The MDM module can be activated in the Endpoint Protector interface with valid licenses, so there is no need to setup a different server, saving time and other resources. MDM by Endpoint Protector minimizes data security incidents due to apps restrictions and password-based policies, as well as encryption activation or remote wipe capabilities. Additionally, it provides useful information about devices, helping administrators with the inventory. Endpoint Protector can protect confidential information throughout the entire network, regardless if the computers are Windows, Mac or Linux-based. This will provide a safer working environment, regardless if you are using the latest Windows 10 or macOS Sierra. The user interface is available in more than 10 languages, making the administration easier by bridging the language gap. Among the provided languages: English, German, French, Spanish, Romanian, Korean, Russian, Chinese, Hungarian and more. Take advantage of Active Directory or similar tools, making larger deployments simpler. Import and sync all groups and entities. It will also simplify device management and content filtering policies with customizable templates for defined Active Directory GPOs. The Endpoint Protector client software has a minimum footprint, using very little memory and reducing end-user impact. Our DLP solution requires during regular usage less than 1% CPU and approximately 22 MB, which is less than typical desktop applications like instant messaging or e-mail. The Hardware Appliance is a Plug&Play solution, that allows IT Administrators to set up Endpoint Protector within minutes, with a few simple steps. It is suitable for organizations with more than 15 endpoints and it presents advantages like dedicated resources and isolation from other security solutions, making the process of detecting possible incidents easier. As a second option for an on-premise DLP solution, Endpoint Protector also comes as a Virtual Appliance. It provides increased flexibility, easy scalability, and affordability. The solution comes in different formats, compatible with the most common virtualization tools, like VMWare, VirtualBox, vSphere, HyperV, Parallels, XenServer and many others. The possibility of transmitting all logs to a SIEM server allows for a seamless experience of the reporting and analysis capabilities by delivering high-quality data to one location. Your business will benefit from comprehensive analytics and graphics that provide real-time correlations for faster detection of incidents and threats. Protect data on Terminal Servers and prevent data loss in Thin Client environments. Control the use of portable storage devices and filter data that is being copied or uploaded to cloud storage and other online applications. HIPAA policies allow for an in-depth scanning of documents and blocking file transfers if they contain sensitive information like FDA approved drugs, ICD-9 codes and diagnosis lexicon, Personally identifiable information like Social Security Numbers (SSNs) and others. Create policies for local and network printers to block printing of confidential documents and prevent data loss and data theft. Data Loss Prevention for Printers can be implemented with the use of both the Device Control and the Content Aware Protection modules. The Appetizer License offers totally FREE Data Loss Prevention and Mobile Device Management for small networks with up to 5 computers and 5 mobile devices. Perfect for SMBs to protect sensitive information against data theft, data leaks, and data loss. The Trial License allows access to all Endpoint Protector’s features for a period of 30 days. Protect and manage up to 50 computers running on Windows, Mac OS X, and Linux as well as 5 Android or iOS mobile devices. Endpoint Protector DLP and MDM solutions support organizations to become compliant with industry rules and regulations like PCI DSS, HIPAA, SOX, and others and avoid huge fines and other prejudices. IPs, MAC Addresses and Usernames are part of any DLP solution. Gaining a better visibility into the network and understanding of users can be achieved by leveraging Employee IDs, Teams' membership, Computers (physical) Location, accurate contact details, and more. By default, Device Control Rights apply globally throughout the network. However, the module is extremely granular. Device Control rights can be granularly configured based on groups, allowing different access rights for various departments. Device Control rights can be configured per computer. It is helpful when computers serve a unique role in the organization. Based on their roles and tasks, each user can receive different device access rights according to the company policies. The granularity of the rights can be drilled down to the device level, based on Vendor ID, Product ID and Serial Number. Rights can be created based on classes of devices making management easier for products from the same vendor. For encrypted devices, different access rights can be configured based on the level of encryption (software, hardware, etc.). Temporarily allow device access to computers disconnected from the network. Ensure security and productivity. In addition to the standard rights, additional Device Control Policies can be set to apply when outside the normal working hours. Business hours start and end time, as well as working days can be set. In addition to the standard rights, additional Device Control Policies can be set to apply when protected endpoints are outside the company’s networks. To ensure enforcement of rules, DNS Fully Qualifed Domain Names and DNS IP Addresses are considered. Filters can be created based on predefined content such as Credit Card Numbers, Social Security Numbers and much more. Filters for sensitive data can also be created based on custom content such as keywords and expressions which can be added in various Dictionary Blacklists. Advanced custom filters can be created to find a certain recurrence in data transferred across the protected network. File Type Filters can be used to block specific documents based on their extension, even if these are manually modified by users. While all other attempted file transfers are blocked, whitelists can be created to avoid redundancy and increase productivity. Enforce company policy but allow employees the flexibility they need to do their work. Whitelist company portals or email addresses where employees can send sensitive data. Define up to which number of violations a file transfer is allowed. It applies to each type of content or to the sum of all violations. Revoke screen capture capabilities and make sure no valuable data displayed on the screen is leaked out of the protected network. Eliminate data leaks of sensitive content through Copy & Paste / Cut & Paste, further enhancing the data security policy. Temporarily allow file transfers to computers disconnected from the network. Ensure security and productivity. Record all file transfers or attempts to various devices, online applications and cloud services, providing a clear view on users’ actions. Save a copy of files that were transferred to controlled devices or through emails, cloud storage or other applications. Granular e-mail alerts can be set up to provide information on the most important events related to device use and confidential file transfers. Monitor activity related to device use and file transfers with a powerful reporting and analysis tool. Logs and reports can also be exported. 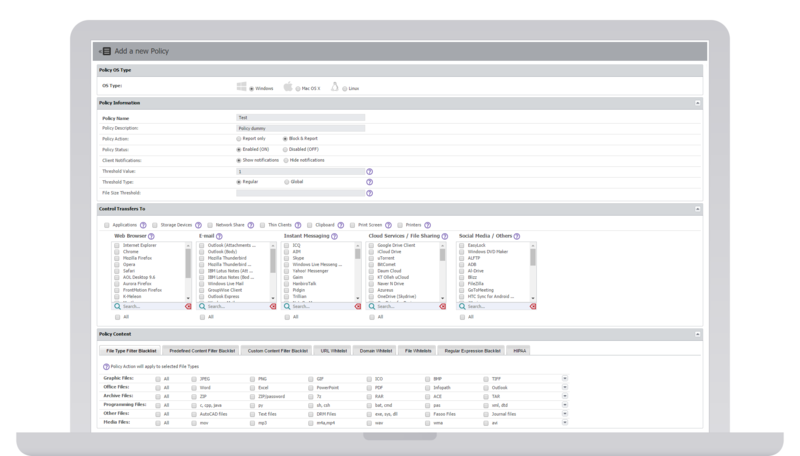 Manage DLP and MDM policies and check reports from any device, from desktop to tablet with the responsive management console. Administrators have quick access to alerts about licenses state, new available features and other important events directly on the management interface header. Scheduled scans can be set to start inspecting data at rest on a specifc date and time. Incremental detection of sensitive content can be confgured as a single occurrence or to re-occur at regular intervals (e.g. : every 7 days, every 30 days). Once confidential data is identified with eDiscovery, the Administrator has the option to encrypt it with AES 256 strong encryption solution in order to prevent unauthorized employees’ access and further having the possibility of leaking data. Secure data and ensure compliance with industry regulations by deleting sensitive information immediately it is identified if it violates the company policy. Scan results are available for export in Excel, PDF or CSV files and can be used as reports for the management or as audit documents. The scan results provide the details about computers where sensitive data was found, what sensitive data, the path, time of discovery, if it was encrypted, deleted or reported, and other valuable information. Create custom eDiscovery policies defining what content is sensitive for your organization depending on file type, predefined content, custom content, file name, Regex or HIPAA protected content. Start scanning for sensitive data according to selected content.